Welcome to yet another edition of the Dear Daily Freier advice column! An outlet that has already allowed YOU the reader to gain needed advice about such pressing subjects as the Israeli bus system, relationships, and pétanque! So without further ado, here are the answers you did not want to the questions you already regret asking! 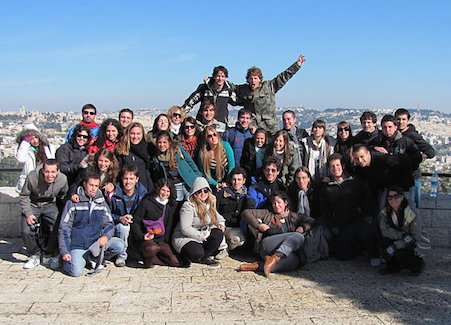 Hi, so I went on Birthright last month and it was A-MA-ZING. But here’s the thing. The soldier on our bus? Danny? From Hadera? Well when we were down at that big crater in the desert….Mizpe Ramon? Well Danny and I (“may have”) wandered off for the night together. I mean, he was so romantic! He even wrote me a poem! In English and Hebrew! But the thing is, later on the trip I’m pretty sure he also “wandered off” with that girl from LA who pretends to be spiritual but is actually just an idiot. Also the girl who went to Amherst. And maybe the girl from Texas with Israeli cousins. And just now I saw on Facebook that Jess from Seattle posted a poem of his. So anyway, I skyped Danny and confronted him about it, and all of a sudden it’s like he forgot how to speak English. He was just mixing up random words in Hebrew and English and I think Spanish. Anyway, what’s the deal? I mean, is he really a romantic or did he just want to hook up with all the girls on the trip? OK, So I just graduated from NYU. And I’m Jewish. But not Jewish-Jewish. Honestly, I’m not too big on the Temple I grew up in anymore. Or Trump. Or Israel. Because my Intersectional Feminism Professor said that Israel is bad. Like really bad. Anyway, I’m looking for career advice and wondering if you can help me. Like, if you were a Jew who disliked Israel, most Israelis, and also about half of American Jews…. what career field would you go into? Have you thought of becoming a Professor of Judaic Studies at any given University? So suppose you are an amazing leader. A great leader, Very great. The Best. And let’s say you just did something Very Big for a country in the Middle East. With a lot of Jews in it. Nobody loves the Jews like I do. I have the best Jewish grandchildren. Just the best. So again, let’s say you just did something very big for the Jews there. And the Jews in Israel? They Love it. “It’s the Best.” All of them told me that. And Bibi? Great guy. Great, great guy……..But then there’s the Jews in America….. Some of them say thank you. But, gotta admit, some of the others? Not so thankful. No gratitude. Sad. Very Sad. Anyway, I think I lost my train of thought. But do you know what I’m saying?